There’s something comforting about people knowing your name. I venture even if you end up with some unfortunate name like Engelbert Humperdinck, you get used to your name, and it grows on you. And can there be any sound sweeter than that special someone whispering your name in the dark? I was a young child when I first visited the Tomb of the Unknown Soldier in Washington, DC. And even at that tender age, I distinctly remember the profound sadness that struck me that someone had left this world, someone who had laughed, and cried and loved and no one knew they had gone. Or perhaps that they had even lived. No one to shoulder a pack on Memorial Day bearing his name in remembrance of him. I had long heard of and wanted to visit the Cemetery of the Nameless. Once, years ago, at the prospect of soon returning to the States, I actually ventured on a bus that I believed would take me there. I ended up spending the day somewhere completely different. A good day. But not where I meant to go. 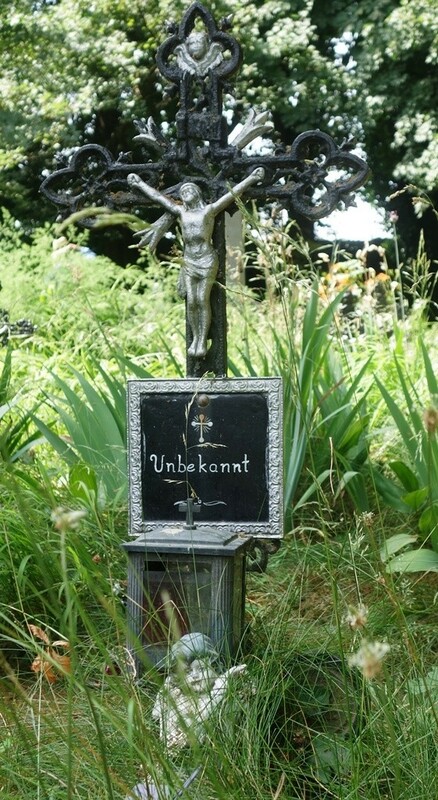 So this past weekend, on a Sunday drive back from wine country, the after-rain sun illuminating the world in a friendly glow of promise, with nothing but the road and a lust for life, I punched the “Friedhof der Namenlosen” address into the “Navi.” Not such an easy task since Google refused to betray the address. How Ethan Hawke and Julie Delpy managed to find it before sunrise is beyond me. But I’ve always liked a challenge. So I entered the address to the Gasthaus zum Friedhof der Namenlosen (the restaurant with the same name that I ventured would be close by): Albern 54, 1110 Vienna. Despite the Navi, we still almost missed the turn and found ourselves on back roads by the Danube seaport surrounded by menacingly tall buildings with tiny windows, mammoth-sized cranes, concrete silo structures and unattended weeds and overgrowth. In Anytown America, this would have been just another Miracle Mile back alley but in a country where the guys at the dump yard adorn their break-time containers with flower boxes, this placed seemed eerie. And the perfect place to dump a body. Or two. Or a few hundred. And that’s exactly what the Danube had done here for decades. 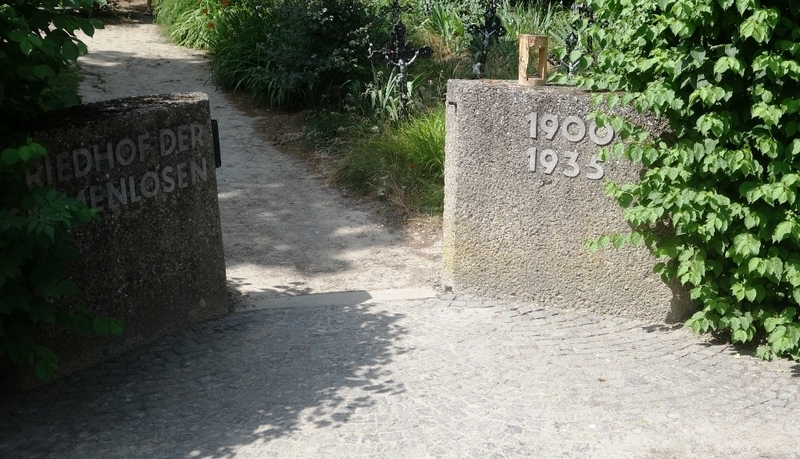 On the shore of current kilometer 1918, the Danube washed up the remains of Viennese who had grown “life tired” (Lebensmüde) and ended their lives in her cold wet womb. 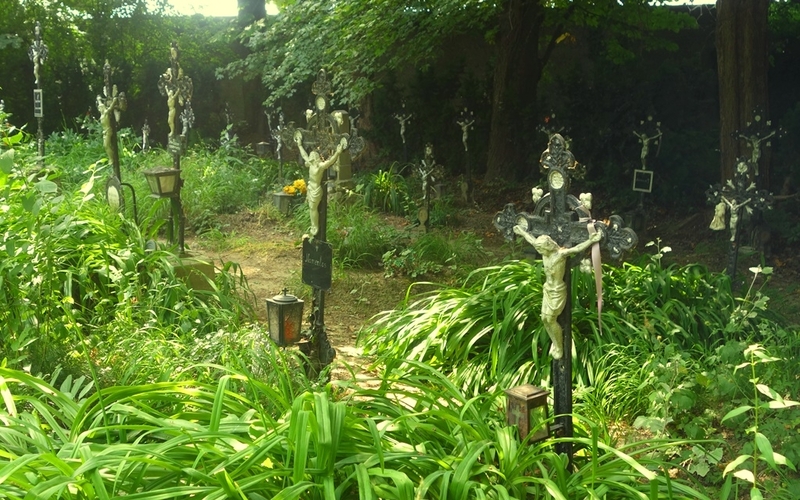 The old cemetery (1840 – 1900) existed on the opposite shore side and the 478 nameless souls who rest there are now only memorialized by a cross. The flow of the Danube flooded the original cemetery so often that in 1900 Vienna moved the cemetery to an area behind a high water dam to where it now stands today. 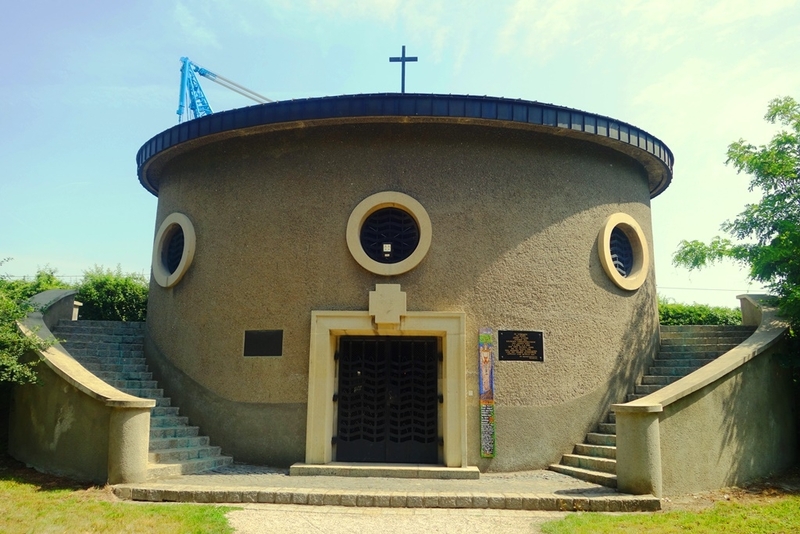 In 1935 the tiny Resurrection Chapel was erected. In 1940 the last burials took place here. Changes in the Danube current stopped the bodies from washing up to shore here years ago and those who get “life tired” nowadays are buried in Vienna’s Central Cemetery. Of the 104 accidental, self-induced and forced victims of drownings buried in the Cemetery of the Nameless, only 43 have been identified – 61 remain nameless. But little Willy is not alone. The candles, flowers, toys and stuffed animals adorning many of the graves are testament that perhaps those who died here will forever remain unknown, but they will never be forgotten. The Worker-Fisher-Club (Arbeiter-Fischer-Verein) makes sure of that. Every year, on the afternoon of the first Sunday after All Saint’s Day (November 1), they build a raft and decorate it with wreathes, flowers and a symbolic gravestone with burning candles and send it off down the Danube in remembrance of the desperate souls who tried to find a final peace forsaken them in life.